Google Chrome gets updated very often. You may not have noticed it because Google automatically updates and installs the latest stable version of Chrome. Even Firefox is trying to play the catch up game but I still don’t think they will ever catch up when Chrome is already at version 16 now and Firefox is only at v9. Whatever the case is, have you ever wondered what goes on when Google Chrome is being updated? Will the new version overwrite the old version? Or does the old version gets uninstalled automatically? The answer is the previous version of Google Chrome are kept and not removed. If you check the folder where Google Chrome is installed, you would noticed that there are 2 folders with different version numbers and two chrome executable files (chrome.exe and old_chrome.exe). Obviously chrome.exe with the newer version number are the most updated Chrome while old_chrome.exe and the folder with older version number is obsolete. One probable reason that the old version is still kept because of rollback purposes but the official Chrome FAQ page mentioned that they don’t recommend you to roll back Google Chrome to a previous version. The old version of Chrome takes up about 80MB space from your hard drive and it is actually safe to remove the redundant old Chrome files since they are not being used at all. 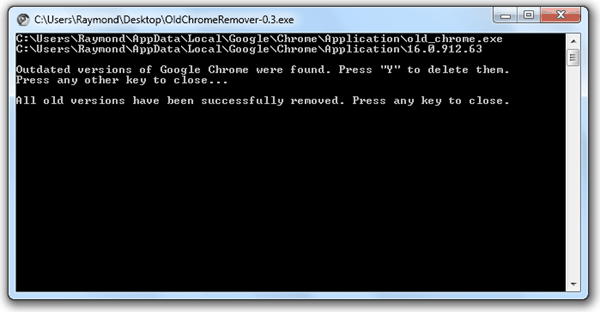 If you want to manually delete the outdated Chrome from your computer, here is how you do it. First you need to enable show hidden files, folders and drive from Control Panel > Folder Options > View tab. Then open the following location with Windows Explorer. Delete old_chrome.exe file and the folder that shows an older version number. Alternatively, you can use a free and portable tool called OldChromeRemover which automatically detects the obsolete versions of Google Chrome and deletes it when the user press the Y button on the keyboard. OldChromeRemover requires Microsoft .NET Framework 3.5 and also Run as Administrator to work. I use the portable version of SRWare Iron (Chrome without advertising). When a new version comes out, I simply copy my Profile folder to the new version. Done. Releasing newer versions is not always a good thing. While it shows that they are committed to improving, it also shows lack of testing and security prior. Beyond that, I’d hate products that constantly update without my consent, mostly because they can screw up not only their product but if there is a sufficient memory leak or other critical error, it can cause a system wide crash. I would like at least be aware of what was changed so I know to either revert or delete it. I can not find “folder options” with Windows 7. are there instructions for Windows 7? Download and install Revo Uninstaller. Run software , right click on any software, you will see options to go to folder location. QED. Cool share, works like a charm,ty. It is good if you can modify the installation path as I installed Google Chrome for all user account in my PC. I can see the two folders, but I do not see chrome.exe or old_chrome.exe. Is it safe for me just to delete the older of the two folders?